Step 1: Cut two pieces of corrugated paper long enough to comfortably fit around the wearer like a tube. Tape the two pieces together with gaffers tape to make one taller tube that is 28” tall. Cut holes for arms toward the top of the tube. Step 2: Cut out a 17” round of cardboard. Trace the opening of the tube onto the round and cut out the hole. The finished shape should look like a donut. Attach the end of the corrugated tube to the round of cardboard with hot glue. 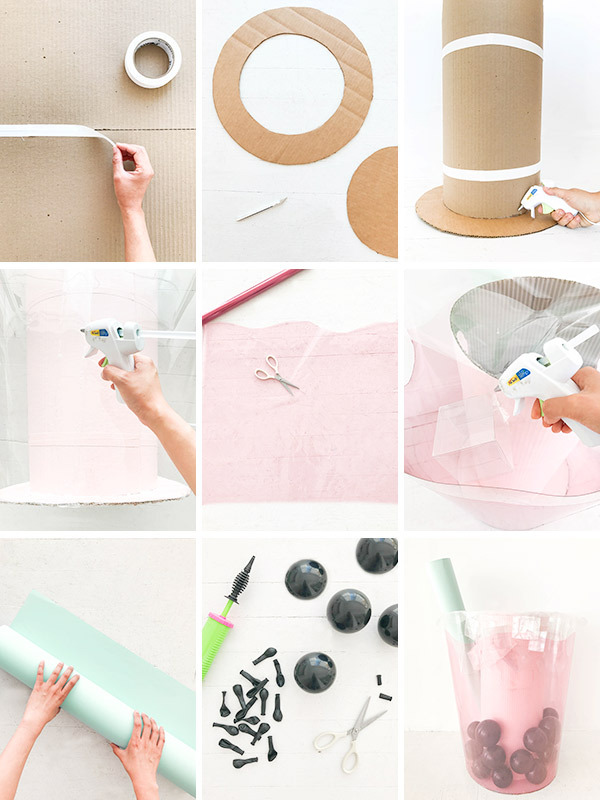 Spray paint the tube and round light pink and let dry completely. Step 3: Roll out the plastic roll on a big, clean workspace and cut a piece that’s 74” long. Cut a slight arch out of the piece. The piece should be 71” at the longest point with a height of 28”. The extra 3” in length will be a tab that you’ll use to glue the plastic cup together. Step 4: Glue the bottom of the plastic around the the outer rim of the donut shape. Overlap and hot glue the ends of the plastic together and hold in place until cool. Carefully cut arm holes from the plastic tube using an x-acto knife and a pair of good scissors. Step 5: Wrap the cup in pink cellophane with a wavy pattern at the top. Adhere with glue on the back. Then, cut holes for arms. Step 6: Add ice! Assemble 3” clear boxes and glue them to the cardboard tube. Step 7: Cut a big circle out of clear cellophane larger than the diameter of the cup’s opening. Glue it to the top of the cup. Then, cut the center of the cellophane to make a hole for the wearer’s head. Step 8: Roll the big sheet of cardstock into a tube and secure with hot glue. Cut the bottom of the straw at an angle to look like a boba straw. Then, cut a hole into the cellophane top, and insert the straw. You’re nearly finished! Step 9: Cut two long pieces of nylon webbing. Using the wearer for reference, glue the straps to the interior of the tube. 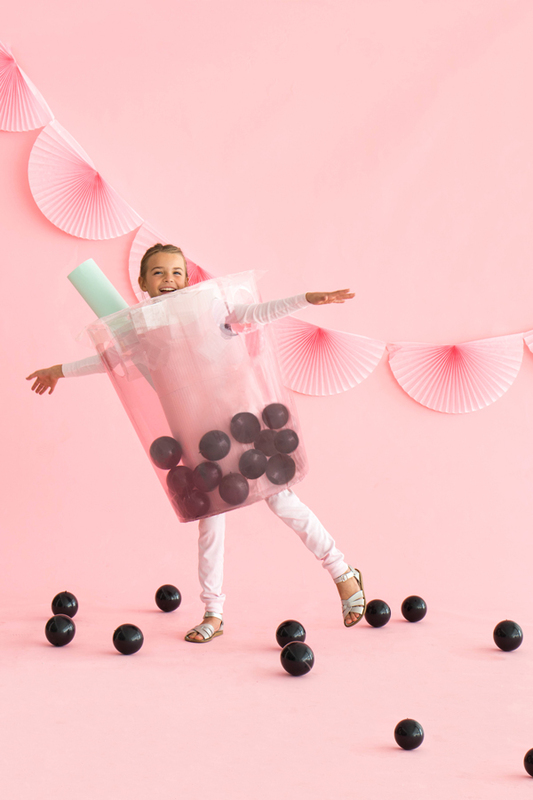 Step 10: When you’re ready to wear the costume, inflate black mini balloons until they are round in shape, knot, and trim ends to make boba. 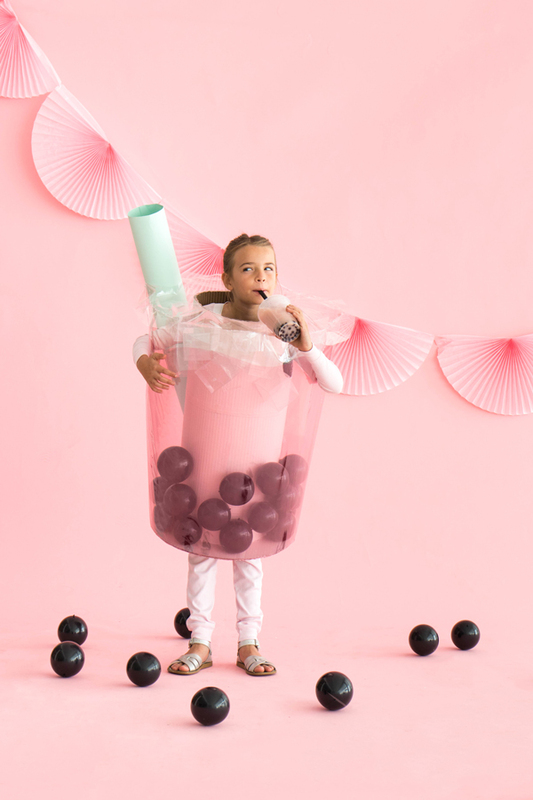 Insert the boba through the arm holes. Repeat until the bottom of the cup is filled. You’re ready to party! This is the cutest! What a funny idea! OMG! 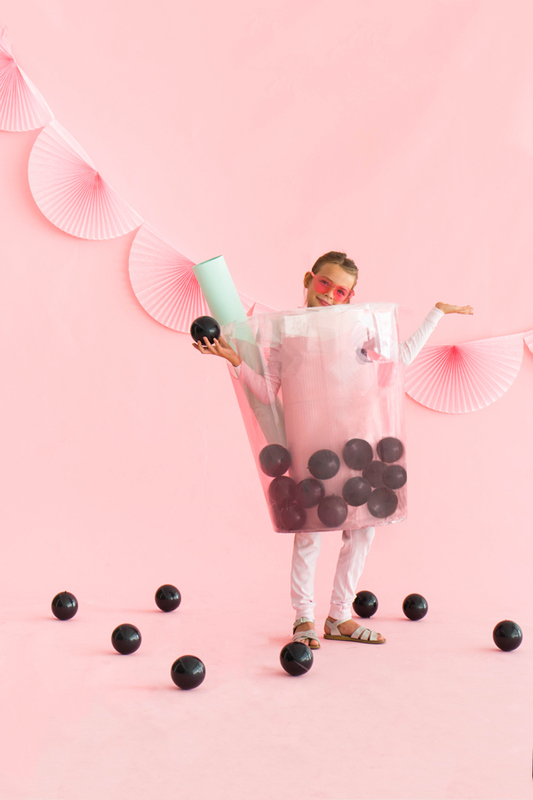 I cannot get over how hilarious this costume is! 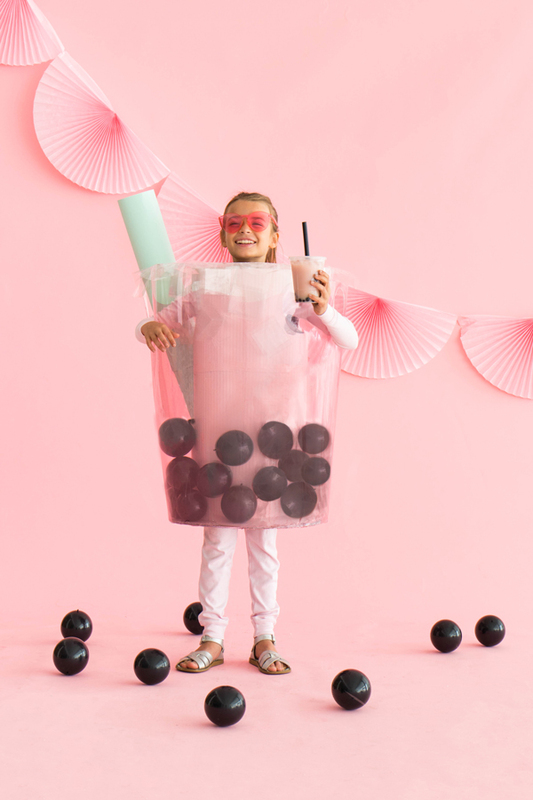 I just posted a list post of cute Halloween costume ideas from Pinterest and I WISH I had seen this!